Okung wanted fewer years, and more guaranteed money than Eric Berry. He got neither. It took only six days from the start of training camp for all of this year's first round draft picks to agree to deals. That has to be some kind of modern record. But the last man standing, Seattle LT Russell Okung, got only a weeklong vacation from camp for his troubles. Okung wanted five years, instead of six, so as to test free agency sooner. He also wanted more guaranteed money than the $34 million given to the Chiefs' Eric Berry, who was drafted before him. 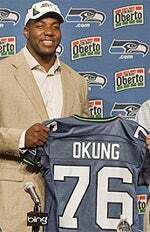 Today, Okung signed for six years, with $29 million guaranteed. So, that was fairly pointless. Okung generated some bad blood, but didn't get the Seahawks to budge. Still, first round holdouts have become something of a tradition, thanks to the lack of a rookie pay scale. Sure, it's been broached, but torpedoed by the NFLPA's insistence on packaging a new four-year maximum as part of any deal. But then what of the lower-drafted players who break out? They end up holding out for more money the next season anyway. It's a mess. In any other league, we'd consider holdouts as a way of life to be laughable, but in the NFL, it's just another bargaining chip as long as contracts aren't guaranteed. The NFL is the country's most popular sport, and the best run in a lot of ways. But their labor issues are easily the most dysfunctional in all of sports. CBA negotiations should be a fun time.